This being a Leap Year and with February 29 looming before us, I started T*H*I*N*K*I*N*G.
Thinking about Leap Year involves some rather mind-bending concepts, like the first year of the AD calendar being Year 0, which would be a Leap Year. And the fact that Leap Day is just the aggregation of all the minutes that were lacking in each day during the past 4 years. So, we’re not actually given more time, but rather catching up on the time we’re owed from the last four years — 6 hours per year, about a minute per day, right? Thinking about Leap Year also makes me wonder — Why hasn’t this magic ‘EXTRA’ day been exploited, not even by Hallmark. And, why do I moan about how time is flying by, and then squander the gift of an entire day without acknowledging how special it is? Why didn’t I treasure each and every February 29 in much the same way as my Birthday? Well, this year will be different. I’m making February 29 a special day with some special activities — going to a movie seems most appropriate, since it’s the day after the Academy Awards. I’ll spend the week ahead waiting in anticipation. I’ll aim to savor every single minute, collecting on my IOU of time. And, I’ve put a reminder “Celebrate Leap Year Day” on my calendar for February 29, 2020. Hey, now I’ve started T*H*I*N*K*I*N*G about what a really special year 2020 is going to be — yep, I just checked and they’re already talking on the ‘Net about that . . .
Have you checked out leapyearday.com ? Hi Leap Year Lady! I have indeed checked out the site, even shared a fun link to the various celebrations happening on the 29th. 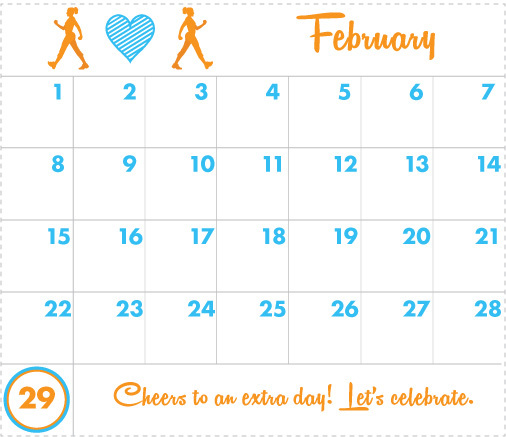 Thanks for gathering all the leap day info in one spot, and cheers to a fun 29th.